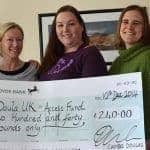 Doula UK (DUK) registered doulas provide physical, informational and emotional support. Any type of medical or clinical assistance is contrary to the Code of Conduct agreed upon by DUK registered doulas. This statement outlines the considerations Doula UK believes a doula must make with regards to complementary therapies. There has been growing public and professional interest in complementary therapies over the last decade (Tiran, 2005, Ernst et al., 2005). Many childbearing women are becoming increasingly interested in the use of complementary therapies during pregnancy, childbirth and the postnatal period. Some of these therapies are self-administered, while others are practitioner-administered. Knowledge of and appreciation of the risks and benefits of these therapies are of great benefit to the doula. Many of the organisations and individuals who promote complementary therapies in the UK are working to develop regulatory systems which will protect the public. The Prince’s Foundation for Integrated Health and the Department of Health are in the process of developing a regulatory framework for complementary healthcare practitioners to ensure that they meet agreed standards of practice and competence. The aim is to protect the public and to enhance the status of practitioners. In addition, the Society of Homeopaths maintains a national register of qualified homeopaths. The House of Lords Select Committee on Science and Technology’s report, Complementary and alternative medicine (2000) places acupuncture, chiropractic, herbal medicine, homeopathy and osteopathy in group 1. This group is considered to consist of professionally organised alternative therapies, which have undergone more significant clinical trials. However, many complementary and alternative therapies are under-evaluated, some are not amenable to randomised control investigative methods and not all therapies are safe or appropriate for use during pregnancy and childbirth. It should not be assumed that because a therapy is “traditional” or ”natural” that it is safe. Complementary and alternative therapies should be treated with the same caution and degree of expertise as any other clinical intervention and subject to the same rigorous evidence-based evaluation. Doula UK acknowledges that many women find the use of complementary therapies to be emotionally and physically helpful, and may use them for a variety of reasons in pregnancy, during childbirth and for healing purposes following birth. Doula UK respects the rights and informed choices of individual women to self-administer complementary medicines as appropriate or to seek advice and treatment from qualified complementary therapists. Doula UK believes that it is entirely appropriate for doulas to gain competence in new skills so that they can offer women a wider range of choices including non-invasive therapies. Doulas who undertake to administer complementary therapies undergo an approved education and training programme and be competent to offer these therapies. Doulas who are trained to practice in complementary therapies ensure that they keep their different roles separate and their clients informed of the nature and extent of the therapies being given at different times. Doulas trained and competent to practise complementary therapies are recommended to organise insurance cover for these therapies. Doulas who are not trained to provide advice or care in complementary therapies refer a woman seeking information or advice to an appropriate therapist. Doulas with knowledge, skills and competence in the areas of complementary medicine make it clear to their clients if they do not have an official qualification in the therapy they offer. While there are workshops for doulas on complementary therapies, e.g. aromatherapy or homeopathy, these do not mean a doula is qualified to practice in this field and should just be used to give doulas confidence when supporting clients to investigate or use these therapies. It is not part of the doula role to give advice, which includes specific advice or recommendations regarding complementary therapies. Ernst E, Schmidt K, Wider B. (2005) CAM research in Britain: the last 10 years. Complementary Therapies in Clinical Medicine 11: 17-20 Nursing and Midwifery Council. (2004) Midwives rules and standards. NMC: London Nursing and Midwifery Council. (2006) Medicines management. NMC: London Tiran D. (2005) Complementary therapies in maternity care: personal reflections on the last decade.